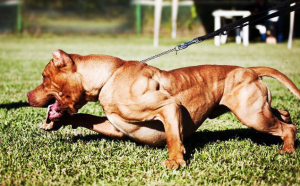 When it comes to Pit Bull muscle building & strength training Pit Bulls, there are many options available that are safe and fun. First of all, the various pit bull breeds are genetically very muscular. Some owners want to see them buffed up more and engage in more exercise and dietary changes to achieve this. As long a the dog’s best interest and well being are foremost this regimen can be a major advantage. Muscle burns fat. Far too many domestic dogs are overweight and suffer from fat or weight related problems. For pit bulls this can be double trouble. Keeping the dog lean and healthy is a plus and will ward off many illnesses and injuries, that’s when training Pit Bulls comes into picture. Let’s look at diet first. Feeding the pit bull for pit bull muscle building should involve a combination of both diet and exercise. Dog vitamins such as Bully max have also proven successful in training Pit bull dogs, You can read more about Bully Max at the end of my article. Diet should be a dog food or food regimen that facilitates the growth of healthy bones and muscle, not just muscle. Dogs are carnivores and can tolerate lots of meat but too much can harm them. Protein is foremost and making sure the animal gets just the right amount and quality of protein can be the difference between success and failure. Raw meats along with 15 percent of cooked veggies is suggested for optimum muscle building. 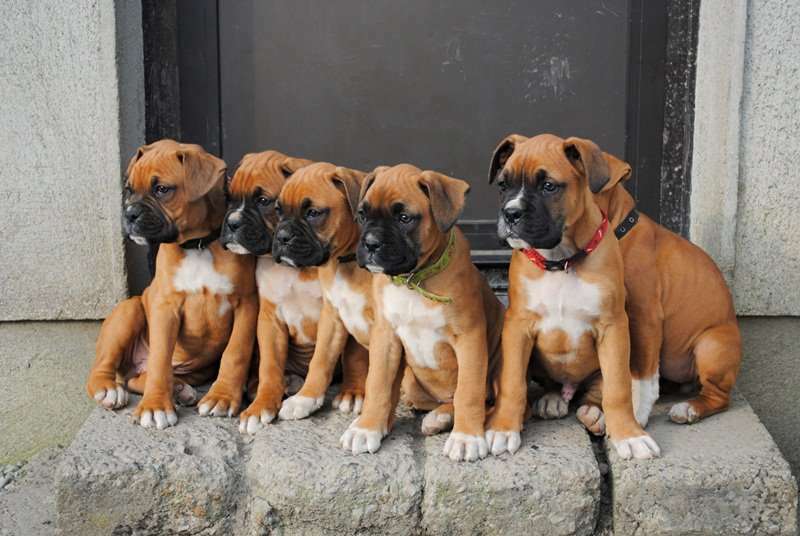 Ask specialists in the breed for their recommendations as well as other owners who are knowledgeable in this. You’ll find those tips and tricks that can help a lot. That in combination with your veterinarian’s guidance can mean a more muscular dog and healthy one. Exercise comes next and the first and foremost is running. This is what dogs love the most. They’ll run at any given moment for any reason. To build up those muscles, just like humans, it’s not how far the dog can run but how fast they can do at short bursts. For people we do wind sprints that builds up the leg muscles fast. For dogs it’s the same and when it comes to pit bull muscle building you’ll try out short bursts of 50 yards. Wait and let the dog rest a minute and rinse and repeat. This causes the muscles to react to short bursts of power and build upon the muscle tissue that is being repaired. The way muscles grow is that they have to be torn first like in bodybuilding. The muscle tissue tears and rebuilds itself in a few days becoming larger and stronger. Same with dogs. Since the pit bull is a breed genetically designed for muscles this should be easy but don’t overdo it. Too much muscle might cause the dog to become deformed and cause other injuries. Other exercises are jumping and hauling objects carrying weights. A big cloth bag with sand in it the dog can be trained to pull or haul can add that resistance training to build up muscle. There are lots of techniques. Some pet stores have exercise equipment and other pit bull owners will be able to share their pit bull muscle building techniques. Look at each exercise and consult your vet about their safety and you should be okay. 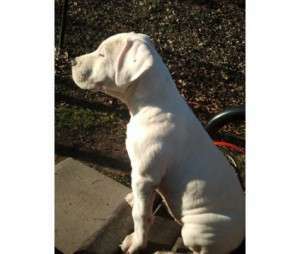 Can I give my dog Bully Max supplements? You can indeed use Bully Max supplements for your puppy. Muscle building generally takes a very long time. But, Bully Max is proven to deliver results in a short amount of time. 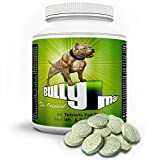 For those of you who don’t know Bully max is a vitamin and muscle building supplement for dogs tailored specifically to Pit bull’s. Bully Max allows a dog to recover quickly from an intense workout as well as help repair muscle tissues to make them stronger and leaner. Many trainers that I spoke to have very good things to say about Bully Max. 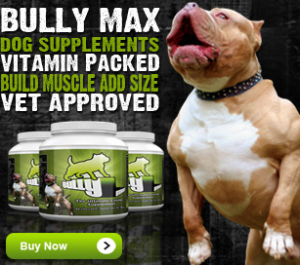 Bully Max not only builds muscle but it also has an overall positive health effect on dogs. This is a very good supplement for conditioning your Pit Bull dogs for dog shows or sports training. Bully Max also provides your dog with a stronger immune system, optimum energy levels, a good metabolism, great stability and proper bone nourishment. Where can I buy Bully Max Supplements? You can get the best price for Bully Max from Amazon and free shipping with a Prime account. While purchasing, don’t waste money on the smaller bottle, only to buy another one in a short amount of time. I suggest you start with the 180 pill supply to begin with and see its full working potential. You can see the Bully Max product page for more purchasing options. 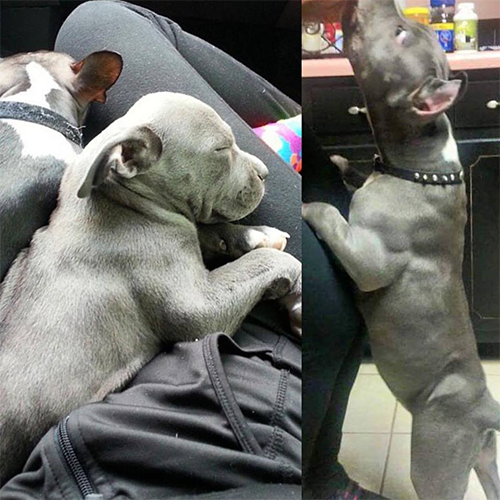 Finally, training Pit Bulls for muscle building should be done with caution and care. Not for looks and showing off but because you want the pet to be strong for the responsibilities you give it. Muscle building takes time, especially if you have an out of shape dog already. Be patient with your dog and do not over train them, causing injuries to our dog is not our goal. While following a Bully Max regimen, be sure to follow directions that come with it, more doesn’t mean better.